Groundwater is stored in the open spaces and fractures within geologic materials such as soil, sand, and rock that occur beneath the land surface. Aquifers are the geologic layers that are filled with water and that can transmit enough water to supply a well under normal hydraulic gradients . Groundwater in gravel, silt, and sand aquifers is found in pore spaces between the particles, whereas groundwater in consolidated aquifers is found in fractures within the rock. The amount of water a given type of rock can hold depends on the rock's porosity, which is the volume of pore space between the grains of the sediment or fractures in the rock. For water to move through rock, the pore spaces must be connected. Groundwater flows very slowly within the aquifer, and the speed of groundwater movement depends on the size of the spaces within the soil or rock, how well these spaces are connected, and the slope (or pressure gradient) of the water table . Coarse-grained sediments like sand and gravel have a higher porosity than small-grained sediments like clay and silt, and the pore spaces are better connected. The coarse-grained materials are permeable because they have large connected spaces or fractures that allow water to flow through. In some cases, pore spaces can be filled by smaller-grained materials, which makes less room for water to enter and travel through the pore spaces. This decreases the porosity, and the aquifer will be less permeable. It is important to be able to determine aquifer characteristics like permeability in order to predict groundwater behavior in the aquifer. Some aquifer characteristics can be estimated from the data found in well reports (drillers' logs). The static water level , location of water-bearing zones, geologic materials, and pump test data are examined to obtain information such as aquifer depth, thickness, and nature. The description and location of geologic formations and water-bearing zones within the formations can give clues as to whether an aquifer is shallow (water is located near the land surface) or deep (water is located deeper, perhaps greater than 30 meters, or 100 feet), and whether it is made of consolidated or unconsolidated materials. The nature of the aquifer refers to whether the aquifer is confined or unconfined. A confined aquifer has a layer of less porous material above the aquifer, resulting in the groundwater being under pressure. When a well is drilled, the water level in the well will rise above the top of the aquifer. An unconfined aquifer does not have a layer of less porous rock above it, and so when a well is drilled, the water level in the well will be at the same level as the top of the aquifer. Well drillers conduct pump tests to determine the performance characteristics of a well and to determine the hydraulic properties of the aquifer such as permeability and transmissivity (aquifer permeability multiplied by aquifer thickness). These properties determine how easily water moves through the aquifer, how much water is stored, and how efficiently the well produces water. Pump tests can allow hydrologists to predict the effect on water levels of different pumping rates, or the addition of one or more pumping wells. A pump test consists of pumping a well at a certain rate and recording the drawdown (decline) of water level in the pumping well and in nearby observation wells over a certain time period. The responses of the water levels at and near the pumping well reflect the aquifer's ability to transmit water to the well. The response allows hydrogeologists to determine the aquifer's characteristics. Water levels will drop less in more permeable aquifers than in aquifers of lower permeability. Ideally, water levels are measured at predetermined time intervals at the pumping well and nearby observation wells. When a well is pumped, the water level drops in the vicinity of the well as that water moves from the aquifer toward the well (see the figure below). The lowering of the water level is referred to as drawdown. From a threedimensional viewpoint, it appears as though a cone pointing down has surrounded the well. This is termed the "cone of depression." The size of the drawdown cone depends on several factors: the pump rate, the length of time the well is pumped, and aquifer characteristics of permeability and transmissivity. Once the well stops pumping, it will take some time before the drawdown cone disappears and the water table returns back to its original state. In the figure below, note that the drawdown at Observation Well 1 (OW1), located away from the pumping well, is less than the drawdown at the pumping well (Q). The two most common types of pumping tests are the constant-rate pump test and the multiple-step pump test. In the constant-rate test, the well is pumped over a given time period at one rate, whereas during the step-drawdown test, the well is pumped at successively greater rates over short periods of time. 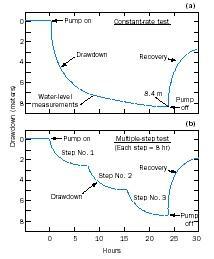 The drawdown of water levels in a well are plotted against the time since pumping began for both constant-rate and step tests. The data from both of these tests can be used to predict the hydraulic characteristics of the aquifer and the well. During the constant rate pump test (see part (a) on page 42), pumping levels are held constant and the progressive drawdown with time is recorded. The relation between drawdown and time is a function of the aquifer permeability. During the step test (see part (b) on page 42), the pumping level is held constant during any one step, but is increased during each successive step. The step test not only can be used to obtain aquifer characteristics, but also is useful in determining the size of the pump that is to be placed in the well. Note the water-level recovery portion in each graph. The rate at which recovery to the original pre-pumping water occurs depends on aquifer properties. There are several methods for interpreting pump test data, including graphical and computer techniques. Over the past decade, computer techniques have replaced more traditional graphical techniques for data interpretation, but hydrogeologists still rely on graphical analysis to examine trends in groundwater withdrawal and also to predict how an aquifer reacts to pumping over time. In order to interpret the results of the pump test, hydrogeologists need data such as aquifer thickness, screened interval, pumping rate, static water level before pumping, and static water level during pumping. These data are input into a computer program and the computer generates aquifer parameters such as the specific capacity of the well, hydraulic conductivity, and transmissivity. These results are then available to be used to assist in the management of groundwater quantity in a number of settings (e.g., municipal wells or irrigation). Aquifer and well characteristics also can be measured after pumping ceases as the water table recovers, providing before-and-after datasets that can offer greater reliability. SEE ALSO Groundwater ; HydroGeologic Mapping ; Modeling Groundwater Flow and Transport ; Supplies, Exploration for Groundwater ; Wells and Well Drilling . Driscoll, Fletcher G. Groundwater and Wells, 2nd ed. St. Paul, MN: Johnson Division, 1987. Fetter, Charles Willard. Applied Hydrogeology, 3rd ed. Englewood Cliffs, NJ: PrenticeHall, 1988. Ground Water. U.S. Geological Survey General Interest Publication. Heath, Ralph C. Basic Ground-Water Hydrology. U.S. Geological Survey Water-SupplyPaper 2220 (1989). Waller, Roger M. Ground Water and the Rural Homeowner. U.S. Geological SurveyGeneral Interest Publication. When a well is drilled, the well constructor (driller) fills out a well report that provides a "view" of groundwater occurrence at the drilling site. A well report is a written document that contains information on how the well was constructed, the geologic materials encountered during drilling, and where groundwater was found. The construction information includes the drilling date; the diameter and depth of the drillhole, well casing, and casing seal; the type of materials used to construct the casing seal; the location of a well screen (perforations in the well casing); a static water level measurement; and pump test data. The well report also includes a section called a well log. The well log is part of the well report that describes the type of geologic material encountered during drilling. The well driller describes the color, texture, grain size and location of a given geologic layer, and whether the layer contains water. If water is found at a certain depth, this is known as the water-bearing zone, or aquifer. By integrating information from many well reports over a wide geographic area, hydrogeologists can map regional aquifers and better understand where groundwater occurs and how it is moving. You mentioned observation wells nearby a test well. Can you shed light on need for observation wells? When in the process of drilling a well with a rotory rig with purg water being pumped into the hole through the drill stem how do you know when you have reached an aquafer? We are about to begin our first well and are real novices. Thanks in advance for your help. so good site,,i want some information about hydrogeology and as well as related topics of ground water.